Trekked 17.4 km (11 mi) today to Rzeszow with a population of over 180,000. We had the benefit of a walking path set off from the highway nearly the whole time (see the pic). The city’s vibrancy was visible at the suburbs with mega-malls and mega traffic–all good things. Then came a McDonald’s–but only the second since starting my walk. That’s not bad. 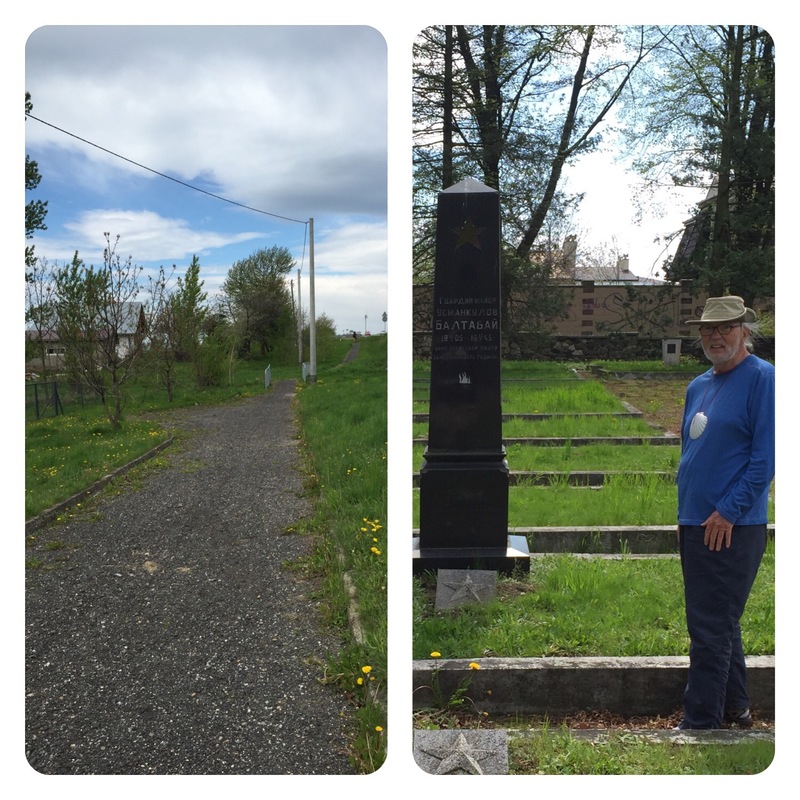 We had lunch on the low walls of a nearly forsaken Soviet cemetery with burials of Russian soldiers through the liberation in 1944. There’s evidence like this here and there. Interestingly, Poland will not celebrate the 1st of May (brings back memories of the Soviet May Day); instead they celebrate the 3rd of May! Just now looking at your Blog. Loving it all – so green and lush – unlike So. CA. Sounds like all is going well for you. You look well & happy. Does look a bit chilly there. Keep posting – like having a history lesson-:). Claudine, Belle & I scoped out Paramount Ranch yesterday for our May 21 hike. Lots of history there. Looks like your 11 miles of walking was on a pleasant path. Maybe the weather is warming a bit too. A picnic in the cemetery was probably appreciated by the forgotten souls who are buried there. You and Eddie are making good progress. I continue to enjoy following along on your journey. Your blog always makes me feel like I’m there..
(I think that new hat is helping you walk faster!!) Big Hugs..